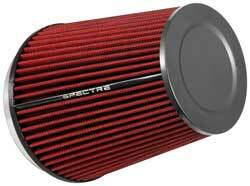 For custom applications, Spectre offers High Performance Racing (HPR) Air Filter. 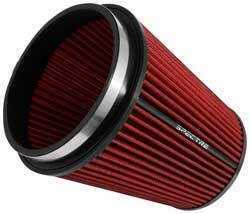 This red reusable media filter is engineered to increase flow and have a long service life. Included are adapter rings which can fit 2-1/2 inch, 3 inch, 3-1/2 inch, and 4-inch diameter tubes. Only the highest quality materials were used including the oiled synthetic media, urethane, and steel mesh. The air filter measures 5-1/2 inch tall, and comes pre-oiled and ready to use. Great for custom builds. Great product! This was a replacement for one that had lasted over 8 years. Have used this filter system since 2005 and it has performed so well I had my cousin, who has a 2015 2500 Diesel Truck, put this system in his truck. Awesome performance!